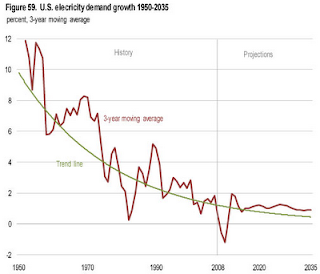 Cold Air Currents: Americans are buying less electricity. That’s a big problem for utilities. WAPO strengthens the erroneous myth of a sudden conversion by not noting 3 of the first 4 reasons it gives for declining demand are long-term behaviours. Homes have been using less electricity. Office buildings are getting more efficient. Solar power and distributed generation is starting to catch on. Ahmad Faruqui and Eric Shultz, two consultants at the Brattle Group, argued that "the drop in electricity demand growth appears to be permanent, not transitory." The connection of decoupling and demand reduction programming is stupid. Utilities should charge for service to allow them to be totally disinterested in consumption. That's the simple message... one being very much corrupted with the foolish movement forcing a business to discourage the use of its product.